SHIPS IN ASSORTED COLORS !Made of strong wear resistant and lightweight aluminum, the Extreme shooting stick, with shooting yoke mounted, provides a steady platform for shooting in a standing, off-hand position that swivels 360 degrees allowing for shots from any angle, for easy horizontal corrections without binding or twisting.Works great for rifle, muzzleloader and handgun hunters. 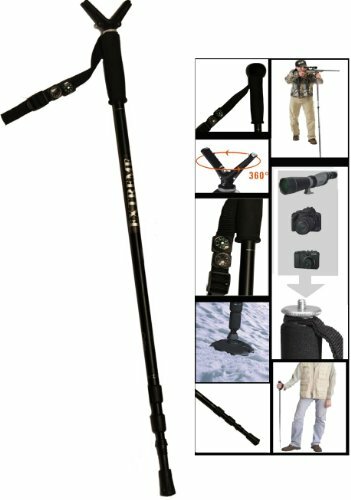 With its height easily adjustable from 29inch to 63inch, it works just as well for shooting from sitting, or kneeling position and can be used as a hiking stick/monopod. Its easy-lock telescoping design has a spring-loaded anti-shock feature to absorb pounding and reduce stress to joints, muscles, and ligaments whether you're strolling through the park or traversing more rugged terrain. The anti-shock feature can be turned On/Off with a twist of the stick. Ergonomic EVA foam grip with hard plastic top knob hides an integrated yoke/camera mount; A wear-resistant carbide tip is mounted at the end for use on hard or rocky surface; Other accessories include rubber end cap for paved roads, snow disc and adjustable nylon wrist strap with compass and temperature gauges. Weight: 12oz. SHIPS IN ASSORTED COLORS ! Constructed of high-strength, lightweight, aluminum with a corrosion-resistant finish, Rubber capped foot to prevent slippage or can be removed to expose a carbide tip for a better grip on hard ground or ice. Adjustable height from 30'' to 63" to works just as well from sitting, kneeling or standing & hiking positions. System Includes: V-shaped yoke cradel that swivels 360 degrees allowing for shots from any angle, Integrated Camera/Binocular/Video-Camera Mount , ergonomic EVA foam grip with top ball, rubber cap for paved surfaces, Wear-resistant carbide tip, snow disc, adjustable nylon wrist strap with liquid-filled mini compass and thermometer. If you have any questions about this product by Extreme, contact us by completing and submitting the form below. If you are looking for a specif part number, please include it with your message.